Posted on December 18, 2017 at 6:02 am. You might be wondering why your heating bill rises drastically over the winter even if you had your furnace upgraded and maintained. Have you checked your home’s insulation? You may find the culprit on those sneaky drafts you never think existed. Save your home from this stressful and truly expensive circumstance by finding and eliminating these sneaky drafts in your home. There are delicate drafts which you cannot easily detect. Fortunately, there are simple and cheap procedures that you can do. Light a candle and walk through your home with your HVAC system turned off. If the flame flickers, then there’s air movement in that area. You can also use a draft detector that releases an odorless smoke which reacts on a moving air. Since the temperature in your home is warmer than the outside, try to move your hands along the edges of your doors and windows and see if you can feel cold air flowing from the outside. You can do the same on the other parts of your home. This time, you can walk through the area and see if you can feel cold air in a certain spot. If you’re that concerned of these drafts, contact your local HVAC technician and schedule a household energy audit. They usually use thermographic imaging to find the presence of cold breezes. It displays the heat patterns in all parts of your home and easily identifies the cold spots in the area. Technicians can also perform a blower door pressurization test which is the first procedure in home energy audit. 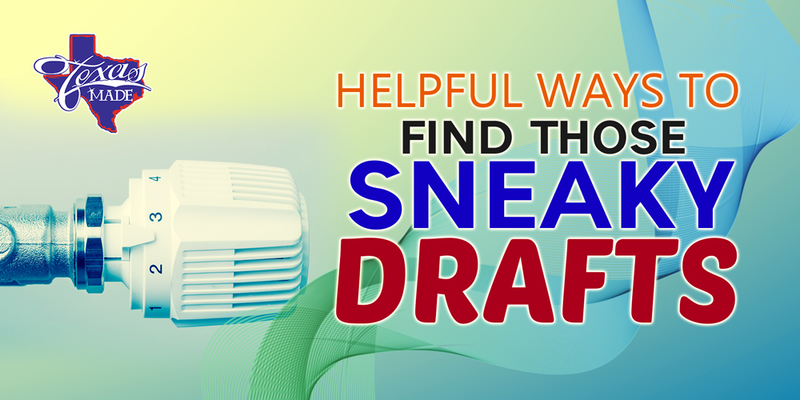 This is an effective way to find drafts in the basements and attics where drafts hide most. Spray Foam. For cracks between ¼ and 3 inches, spray foams are better to use. If it’s your first, you can start by dispensing it onto newspapers. Spray the area with water before and after to cure fast. Caulk. For cracks that are ¼ inch wide or smaller, a caulk is best to use. For doors and windows, choose long-lasting and made for outdoor use. Insulation. The most common cause of drafts is poor insulation. Increase your home insulation especially in the basement and attics. Need a professional home energy audit in Granbury, TX? Texas Made Air Conditioning and Heating is just around the corner!